Abbott and Abbott Fund created the first emergency facilities and emergency medicine residency program in Tanzania. Just a decade ago, emergency medicine did not exist in Tanzania. Most hospitals only had casualty units — a basic room with a doctor who could only write a prescription or provide a referral. Patients might wait hours for basic life-saving care. The mortality rate at Tanzania's national hospital in 2009, according to the International Journal of Emergency Medicine, was 13.6 percent. In Tanzania, Abbott and its foundation the Abbott Fund have created a sustainable model that advances global health and development by partnering not only with institutions but also with people. "Healthcare in Tanzania was far behind other parts of the world," said Dr. Upendo George, one of the first women to join the field of emergency medicine in Tanzania. "Fortunately, Abbott Fund saw things not the way they were, but the way they could be." 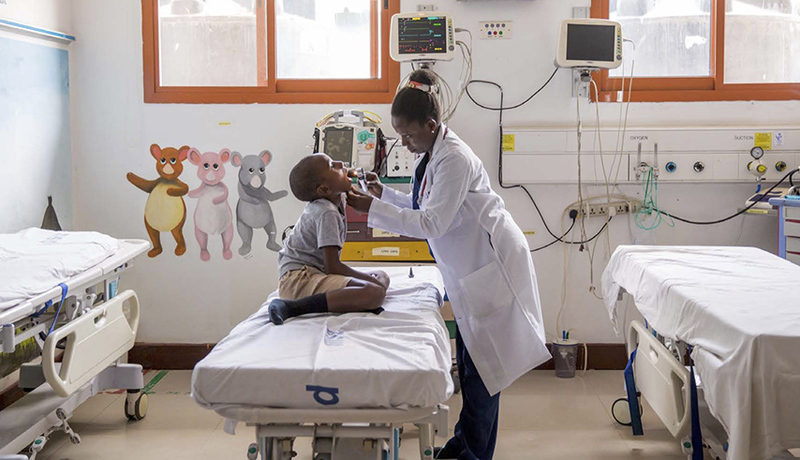 Since 2000, Abbott and the Abbott Fund have worked closely with the Government of Tanzania to strengthen the country's healthcare system, including upgrading patient testing and care at the country's largest public hospital, Muhimbili National Hospital. Building on this work, Abbott and the Abbott Fund began work on a new project in 2009: creating the first emergency medical facilities and residency program in East Africa. The partnership designed and constructed the Emergency Medicine Department (EMD), and equipped it with modern technology and supplies. But beyond infrastructure, a primary focus is to empower a new generation of physicians, nurses and staff trained in providing best-in-class emergency care. Dr. George was a young girl when she first dreamed of becoming a doctor. In the rural Arusha region of Tanzania where she grew up, medicine was a virtually unheard-of profession for women. Tradition dictated that girls grow up, get married, care for their children and manage their households. But Dr. George had a different plan in mind. The new emergency medicine department at Muhimbili National Hospital had just opened when Dr. George was finishing medical school, and Abbott Fund was focused on developing the professionals needed to staff it. At the time, there were no emergency physicians in Tanzania. The Abbott Fund helped develop a residency program in collaboration with the Muhimbili University of Health and Allied Sciences (MUHAS) and leading academic institutions in the U.S., Canada and South Africa. Abbott Fund recognizes that empowering women contributes to global health and development, and the residency program created new opportunities for women in Tanzania. In 2010, Dr. George began her training in the first residency class of the Emergency Medicine program at Muhimbili National Hospital. Today, Dr. George has become one of the leading ER physicians in East Africa: She's now the head of pediatric emergency medicine at Muhimbili National Hospital, and head of externships and elective residents at the emergency medicine department at MUHAS. Altogether, twenty-four specialists have graduated from the residency program. Thanks to the work of Dr. George and her colleagues, and the support of the Abbott Fund, the emergency room at Muhimbili provides critically needed care, regardless of ability to pay, for more than 60,000 people each year. The number of deaths at the hospital decreased by 40 percent within two years after the emergency department opened – saving thousands of lives every year. As word of its high level of care spread across the region, more insured patients began seeking care at the new emergency department. Abbott Fund helped the hospital set up a unique, stand-alone business unit at the emergency department, with social workers, cashiers and an accountant to submit claims to insurance companies. To date, the ER has generated a profit of more than $14 million, while providing free care for the majority of patients. Profits from the ER are reinvested to further strengthen broader hospital operations – providing a new model for financial sustainability in public health. Through their commitment to global health and development, Abbott Fund and its partners have also focused on making the ER model replicable and scalable. Beyond the emergency department at Muhimbili National Hospital, efforts are underway to establish additional ERs in other regions as well, and to train teams to provide lifesaving medical treatment, all tailored to provide the best care in countries beset by resource shortages. These changes are transforming emergency care across the region, in a sustainable way. Abbott Fund is supporting the creation of two new emergency departments at Tanzania's regional hospitals in Mbeya and Mt. Meru. The new ER in Mbeya, led by a residency program graduate, has already served 16,000 patients in its first eight months. The Mt. Meru ER is scheduled to open in the coming months, led by another residency graduate. To date, more than 300 physicians, nurses and students from Tanzania, Democratic Republic of Congo, Ethiopia and Uganda have received training from the emergency medicine residency program. Abbott's support also enables vital research and the sharing of emergency care expertise with international audiences, including students and physicians in the Democratic Republic of Congo, Ethiopia and Uganda. "We're changing Tanzania, one life at a time," Dr. George said, "and there are many more behind me." For more information on how Abbott and the Abbott Fund are transforming the healthcare system and empowering people to build healthier communities across Tanzania, visit www.abbott.com/Tanzania.